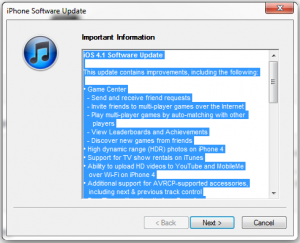 Apple today released a major update for iOS 4.0 that was introduced a few months back. The new iOS 4.1 for iPhone 4, iPhone 3G S and iPhone 3G and iPod Touch 3rd and 4th generation – comes with several software fixes and additional features. As promised, the iOS 4.1 fixes the bugs associated with Bluetooth, Proximity sensor and performance issues on iPhone 3G with iOS 4.0. The Game Center is finally arriving all supported iOS devices through iOS 4.1 update. Apple servers are being crashed at moment as millions people are trying to download the iOS 4.1 update. Here we have the direct download links to iOS 4.1 final ipsw that you can use to update iPhone 4, iPhone 3G S, iPhone 3G and iPod Touch offline using the restore method in iTunes 10. As we have said earlier, iOS 4.1 is the major update after the release of iOS 4.0. The Game Center app that was planned with iOS 4.0 was pushed to iOS 4.1 update, and now it’s available for iPhone 4, iPhone 3G, 3G S and iPod Touch. The Game Center is a facility something like that in Microsoft XBOX Live, that lets you to find and connect with like minded game players online, create profiles, play games, update status, etc. All the features of iOS 4.1 update are available for iPhone 4 For e.g. : the HDR (High Dynamic Range) Photography in iPhone 4 camera software let users to take brilliant shots with more colors and details. Proximity sensor in iPhone 4 will benefit from improved detection of user movements in iOS 4.1. The HD video recorded with iPhone 4 or the new iPod Touch 4G can be uploaded directly to YouTube and MobileMe using WiFi. General features like Bug fixes and performance issue fixes are available for all iOS devices. Now there is an option to turn the spell checker functionality ON/OFF. Download iOS 4.1 ipsw for iPhone 4 here. Download iOS 4.1 ipsw for iPhone 3G S here. Download iOS 4.1 ipsw for iPhone 3G here. Download iOS 4.1 ipsw for iPod Touch 4the generation here. Download iOS 4.1 ipsw for iPod Touch 3G here. Download iOS 4.1 ipsw for iPod Touch 2G here. Download iOS 4.1 ipsw from the direct links given above. Open iTunes 10 and connect your iPhone 4, iPhone 3G, iPhone 3G or iPod Touch 3rd or 4th generation. Now select your device from the left tab. Cancel any prompt requesting to update your device to iOS 4.1 online. Press Shift (option Mac) and the restore button in phone summary page and move to the location where you have saved iOS 4.1 ipsw. Now wait until the device completes the iOS 4.1 installation. We have noticed errors on ipsw’s downloaded with a few download managers. So better use the normal browser based method to download from these iOS 4.1 direct links. when I try to go through there is warning “itune will erase….” will this erase all my data, videos, songs?? I don’t get it! @ its downloading a zip file with no ispw in it!! Try saving the file as .ispw or just rename it. except your world clock location-i don’t know why.I suggest you to backup all your stuff because you can get it after restore. Thanks man it work but should mention that to rename zip file to ipsw. thanks for the info, but i get a not valid ipsw error. if ya’ll decide to jailbreak your phone with the 4.1 software….DO NOT use pwnage tool…it reboots your phone over and over again.. i have a 3g that i updated the software to 4.1 and used pwnage tool to jailbreak…yeah my phone has been rebooting over and over randomly…and ideas on what jailbreak to use for the iphone 3g with ipsw 4.1?? or 4.0?? There is a new version of iREB out that will work for you but here is the actual solution as I have seen and experienced myself and that appears to be affecting most 3GS iPhone users. This is what worked for me and should work for you. What you basically need to do at this point is create a custom IPSW and use iREB to enter the PWNED DFU MODE to install that custom IPSW. NORMAL DFU MODE WILL NOT WORK YOU WILL GET ERROR 1600 or similar. BOTH pwnage tool 3.1.4 and Redsn0w (BOTH ON MAC), didn’t work for me. 2. Make sure you select the activate and cydia install options, when creating the IPSW. IF YOU DON”T NEED TO HACTIVATE THEN DON”T SELECT THE ACTIVATE OPTION. 3. Next put your phone in NORMAL DFU mode (NOT RECOVERY MODE). With the phone powered off, or stuck in recovery mode – PRESS & HOLD THE HOME KEY, and then PRESS AND HOLD THE POWER(SLEEP) BUTTON. If your phone is in recovery mode – you will see the screen go black after approx 7 seconds, KEEP HOLDING THE POWER FOR APPROX 2 SECONDS THEN RELEASE THE POWER ONLY, KEEP HOLDING THE HOME BUTTON for approx another 5 seconds or until your computer beeps at you. 5. Select 3GS and follow onscreen prompts. IF YOU HAVEN’T GOT YOUR PHONE IN DFU ALREADY THIS TOOL WILL TAKE YOU THROUGH THE STEPS. It will sit at waiting for DFU until you get the phone into DFU. It will then install limera1n exploit and LEAVE YOUR PHONE IN A PWNED DFU STATE!!!!!!!!!!!!!!!! DO NOT REBOOT YOUR PHONE OR UNPLUG IT. 7. TEST YOU CAN PING IT!!!!!!!! That will get you back to 4.1 jailbroken with Cydia installed and your set to go. i’m using window 7 and after rename the zip file to .ipsw. went to iTune and tried to restore. there is no file in there. the path is %username%/appdata/roaming/apple computer/iTunes/iPhone software update/the zip file.ispw. please help. all my data will be erased? how can i update without deleting all my files in ipod?